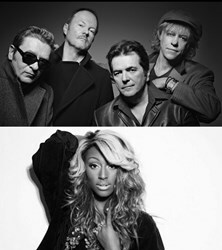 The Boomtown Rats headline with Alexandra Burke, Ruby Goe, John Lawton & Jan Dumee and ZAiiO in support of Arms Around The Child and The Milestone Foundation. Have you ever dreamt of going into Space? This out-of-this-world experience can become a reality at World Privilege Card’s First Annual Gala Ball & Auction on Saturday 5th October 2013 at the Natural History Museum, London, UK. The entire event is supporting two essential charity partners, Arms Around The Child and The Milestone Foundation’s The Passion Project and will be compèred by UK breakfast television’s, Mike Bushell. Event partners and sponsors include (alphabetically) Agelou Horse Racing, Aspen Jewelry and Watches, Aston Martin Racing, Carol Joy London, Lancelot Lancaster White, Pritch London, Silvia Campbell Shoes and The Kensington Hotel, amongst others. This space-themed über-exclusive soirée will attract the crème de la crème of international Society and takes place at one of London’s landmark venues. Christie’s Arne Everwijn will oversee the grandiose auction on the night, including securing three seats on a Space Flight (via a commercial Space Flight of 100km) courtesy of one of the world leaders in this field, expected in early 2015. The 5th October is also a milestone date as it is Sir Bob Geldof’s birthday as well as the launch of National Space Day, sponsored by World Privilege Card. Sir Bob and The Boomtown Rats have taken time out of their latest UK Tour, the first in 27 years, to perform at this ultimate event with a purpose. “I am delighted that The Boomtown Rats have been invited to perform at one of London’s grand events. “Having said that, being the ‘First Irishman in Space’ is not only a fantastic honor but pretty mind-blowing…The First Rock Astronaut – Space Rat! Elvis may have left the building but Bob Geldof will have left the Planet! Wild! Who would have thought it possible in my lifetime. I will be joined by a couple of fellow astronauts who will bid to participate in this extraordinary adventure on this amazing night. Thanks World Privilege Card and Partners”. “A lot of bulging black books have been used to bring together such a high profile and one-of-a-kind launch event this October. I am so grateful to my co-founder Linda Balzanella, the extended WPC team, to all artists and the two partner charities, for all working together and allowing this magic to happen both in 2013 and in the future. Please support our valued charity partners, to whom a minimum of 30 per cent of all ticket sales will be donated, as well as all auction proceeds from stunning lots including three Space Flights, a racing seat at the 24-hour Spa Race in an Aston Martin Vantage GT3 with two former F-1 drivers as your team mates, a one-of-a-kind Aspen One diamond-encrusted watch and bespoke Silvia Campbell shoes. Mind blowing”. “I am truly delighted to have been asked to perform at the first World Privilege Card Ball in support of Arms Around The Child and The Milestone Foundation this October in London. I am completely in awe of the amazing work being undertaken by Arms Around The Child to help change the lives of some of the world’s most vulnerable orphans and street children afflicted by HIV and AIDS." Official Photographer: Lumley Pictures – Jamie Lumley. Arms Around The Child (http://www.armsaroundthechild.org) is the brainchild of the powerhouse behind The Red Hot Organization, Keep a Child Alive, Act V and Endgame, Ms Leigh Blake. This organization was founded to help change the lives of some of the world’s most vulnerable orphans and street children affected by AIDS and HIV. The European Director of Arms Around The Child, Ellie Milner, has been an integral part of the core event planning team. The second valued charity partner for this event is The Milestone Foundation that was founded to encourage young people to become responsible citizens by raising awareness of how their actions affect their lives and the lives of others. Proceeds from this event will specifically support The Passion Project (http://www.passionproject.co.uk), a social engagement project to help combat youth unemployment. All artists, event details and timings are subject to change at the discretion of the event organisers and their partners.